Denim look shirt defines styles and is a synonyms of elegance, sophistication and relaxation. Denim shirt Joni Denim Shirt, Faded Ink, continues to be a timeless piece. 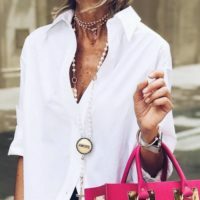 Woman white shirt is one of the items that is used repeatedly and in very different ways, because it suits both formal as more relaxed styles, being particularly suitable for use in professional commitments.